The global 2G/3G/4G residential and enterprise femtocell equipment market grew 4% sequentially in 1Q13, to $115 million, driven by LTE, according to a new report from Infonetics Research. Integrated femtocells are expected to account for nearly half of all femtocell units shipped in 2017, almost entirely within the residential segment. Infonetics forecasts FDD-LTE femtocells to grow at a 76% compound annual growth rate (CAGR) from 2012 to 2017. Cisco, who recently acquired Ubiquisys, sprang to the top of the femtocell revenue share leaderboard in 2Q13, thanks also to its work with AT&T, who lays claim to the largest scale femtocell deployment in the world. 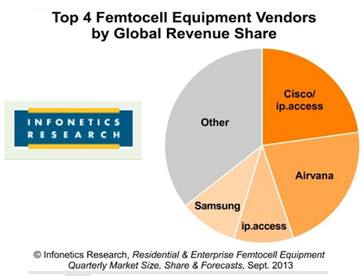 Airvana dropped to the #2 spot overall, but moved into the lead in the 3G femtocell segment. Australia's NBN Co named a panel of outside consultants and appointed an executive to help with a Strategic Review of its operations. A 60-day Strategic Review is being undertaken by NBN Co’s Board and executive management pending the introduction of new Government policy in the wake of the nation's recent elections. Mr. JB Rousselot has been to the new position of Head of Strategy and Transformation, responsible for activities within the Quality group and also the corporate planning, strategy and decision support functions of the office of the Chief Finance Officer. He will lead the Strategic Review process and then help manage the implementation of recommendations and their incorporation into the company’s 2014-17 Corporate Plan. Boston Consulting Group will participate in the review of the timing, financials and product offers under alternative models of delivering very fast broadband.